You may recall that in a previous post (seems like such a long time ago!) I mentioned that I was working on a surprise. Well, I finally finished it and mailed it to that special person just in time for Thanksgiving.He has so much to be thankful for. For those of you who follow my personal Facebook page, you've already seen the surprise, and the recipient all wrapped up in that surprise. The recipient is Peter (aka Pete). If you've been following my blog, you have already seen the Music Quilt that I made for a fundraiser to help cover his medical expenses. 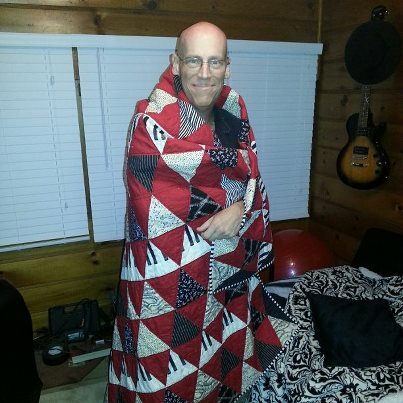 He has completed his radiation and chemotherapy, and now just needs to focus on recovery, and this quilt will hopefully help :) He is making good progress, and we are all thankful for that. I can't seem to get enough of this fabric - Lost & Found by Jen Allyson for My Mind's Eye (Riley Blake) It's perfect for everything! Check out that crazy backing! I thought it was going to cause me to have a seizure! I do believe this is the first label I've ever done. I just couldn't send this without adding a label. 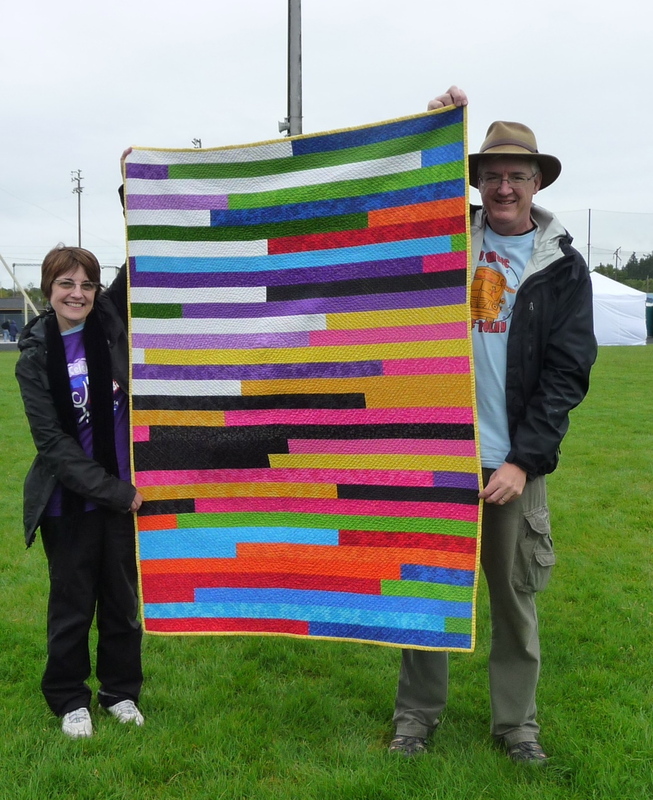 This is Pete all wrapped up in the love of this quilt which my hubby Eric helped me design using scraps from many of the same fabrics that were used in the fundraiser quilt as well as some other music-related fabrics that I was able to find at my LQS. 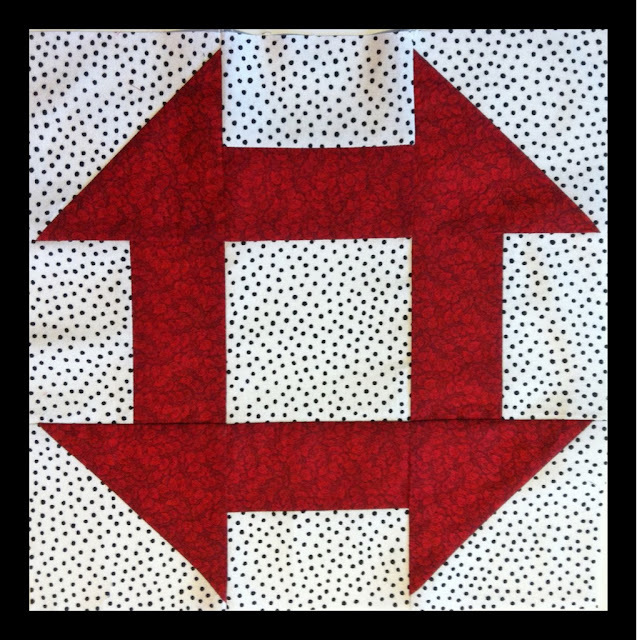 I've given away almost every quilt that I've made, and I have to say this one was the most difficult to let go. I don't know if it was because of the design or the fabrics, or the emotional attachment to it. I know that it will get a lot of use by Pete, his fiancee Yvonne, and their pets. I hope it provides them comfort for many years to come. Wow. That was a serious post, wasn't it? I didn't add anything funny at all. So here's a little funny that Windham Fabrics posted on Facebook. I think it's hilarious, especially the saying on the left (I took over my son's room after he moved out). 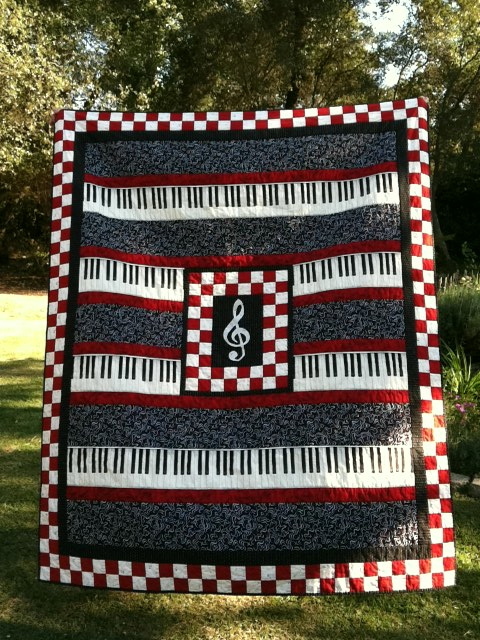 I posted recently on a music quilt that I made to be raffled in a friend's fundraiser....a friend who's battling cancer. 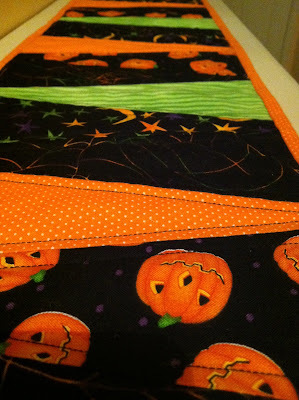 I've decided to enter this quilt in the Blogger's Quilt Festival over at Amy's Creative Side. This is a very special quilt. It was made for Peter.....well, a fundraiser for Peter. Peter is battling cancer....Stage IV cancer....of the head and neck. This is the same kind of cancer that I battled five years ago. I think it was on the very same day that I decided to make a quilt for his raffle that I opened up one of my old Fons & Porter magazines to find a quilt that I had bookmarked as one I wanted to make one day. The quilt was called Beautiful Voices, using the Beautiful Voices collection by Gail Kessler for Andover Fabrics. Some of the fabrics were no longer available. Fortunately, I was able to find the piano keys fabric and the off white musical note fabric. Then my husband went to the fabric store with me to pick out the rest, as this was special to him, too --- he and Peter have been very good friends for 30+ years. I quilted this myself on my Husqvarna/Viking Scandinavia 300 using a walking foot, using stitch in the ditch on most of the quilt and wavy lines (using a Truflex II Flexible Curve because I don't have enough experience with free motion quilting) on the black sections, and outlining most of the keys on the piano section. I also tried my hand at machine applique on the center treble clef. I machine sewed the binding on the front and hand sewed it on the back. I used over 300 pins because of all the different sections and the 54" panels. Crazy!!! I was really happy with the way it turned out, and loved how it looked blowing in the breeze (my hubby is the magic behind the quilt there). After whining for many months to my husband (who works at HP) about wanting a MacBook Air (since I already had an iPhone and an iPad), I weighed the pros and cons, and weighed them again and again. And I continued to get irritated at my iPad crashing multiple times per minute - Yes, I said per minute - I decided to go with an HP Envy Spectre XT. WHAT??? Yep, that's quite a name, isn't it? It's a sleek, brushed aluminum, thin, light, and absolutely gorgeous little machine!!! Don't you think? After our recent trip to California, I decided I wanted to come home and make a little something for our house.....a little something Halloweeny (or is that Halloweenie?) So I decided to throw together a little runner for the table in our entry way using my EZ Dresden ruler. If you haven't tried one of these little babies out, you really should! 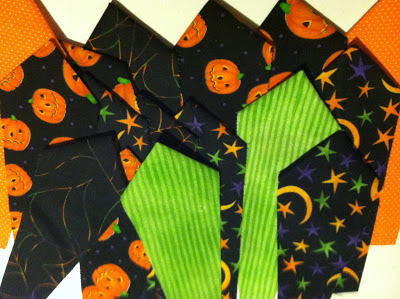 The link above is to a video tutorial on the Missouri Star Quilt Company's website that shows how to use the ruler. I LUV MSQC's videos!!! You can find them on their website or YouTube. There's even an app!!! Oh, and they even have a Daily Deal where you can get some awesome deals on some pretty awesome stuff! Wait a minute.....Wasn't I talking about Dresdens??? That was quite a little advertisement for Missouri Star Quilt Company, wasn't it? No, I was not paid for that advertisement....that's just how much I love them. Anyway.....I just lined up enough of them until it was the length I wanted, sandwiched it, put on a binding, and voila! So easy! I went a little nuts and started chain piecing and ironing some more to make into a Dresden plate wall hanging. The story begins when a friend of ours (one of my husband's very best friends since high school - that was a very long time ago!) was diagnosed with Stage IV head and neck cancer, the very same cancer that I was diagnosed with in 2007, except mine was Stage I. This friend is self-employed producer/director and does not have insurance, so had put off going to the doctor until it got to the point where he was having trouble swallowing. After he was diagnosed, a friend of his decided to put together a benefit concert, with a request for donations for a raffle, to help cover his expenses. 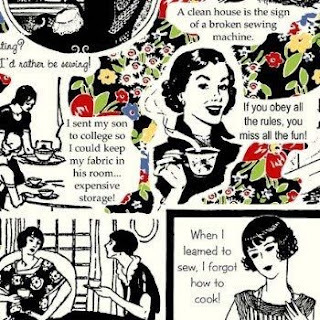 Of course, I offered to make a quilt. That very day, I happened upon one of my old Fons & Porter magazines with a music quilt in it. How perfect is that? I was having trouble finding the fabric locally, so ordered the fabric that was still available directly from the fabric company (Andover), and they even sent me a freebie Flower Doodle charm pack! My husband was very involved in the making of this quilt, and we spent quite a bit of time at the fabric shop, picking out just the right fabrics. I won't get into all the detail of the issues involved with this quilt. I just can't bring myself to relive it -- JUST KIDDING!). It really wasn't that bad. I was just stressing out because it was a quilt that someone was paying for, and I wanted it to be almost perfect. Besides the issues with long spans of lengthwise fabric strips (6 inches x 54 inches), I was also doing machine applique of a treble clef as the focus of the quilt right smack dab in the middle. Talk about some stress!!! Thanks to my wonderful husband, who could stand back and see where the problems were, and do some calculating for me (I hate that part of quilting! ), we got it all figured out. I love that guy! So.....that's why it's been awhile since I've blogged. So glad to be blogging again....I have so much to share! Here are a few of the pics taken throughout this quilt journey. I used over 300 pins in this quilt! Ugh! Stitch in the Ditch. I'm not really sure why I've seen this listed as a beginner's stitch. I think it takes a lot of time and concentration. I do love it, though, since I don't know how to do free motion quilting yet. The finished quilt. My husband is actually holding this up, but I don't see him anywhere in this pic. Freaky! I don't prewash my fabrics, so was a little nervous about those dark colors running. That would've been awful! Thank goodness for Shout Color Catchers! I threw in 3 of those babies just to be safe! Here's Giacomo (my schnoodle) up on my sewing table. He's so jealous of my quilts and always wants to be on my lap. This time he went straight from my lap up on the table. Silly guy! I went to the back of the store to see if the 2-inch Nu-Foam was in stock, and it was!! So excited! Finally! I started walking towards the cutting counter to see about getting someone to cut it for me. No one was at the counter, but I saw an employee walking towards me, so I asked her how I could go about getting a yard of this item. It's a pretty large box - probably at least 2'x2'x2', so I wasn't sure if they rolled it out back there or carried the whole box to the cutting counter. She offered to get the box and take it to the counter because "We can't cut it back here." Ummm....OK...thanks? After we got back to the cutting counter, she said "Did you take a number?" SERIOUSLY?? I think there was one other person in the entire store!! I said "No. I just stopped to ask you a question, and we just got back to the counter." She then asked me to take a number and tell her what the number was. OK, first, I looked around to make sure I wasn't on Candid Camera (is that show still around?) or Punk'd. Then I took a number --#97. She then got on the PA system to announce that she was assisting #97 at the cutting counter. OMG!! It felt like a scene from Saturday Night Live with Kristen Wiig playing a fabric store employee! Ha Ha! When I went through the checkout, I was told once again that they had no bags (they've had no bags for quite a while now!l) Twilight Zone?? So I piled all of my smaller items into my big piece of foam and walked all the way back to my car...still feeling like I was on some TV show. What a strange little shopping trip! ....and we have a winner! I wasn't sure how to use the random number generator that I signed up for, and I didn't want to write down 146 numbers on little slips of paper, so I googled random number generators and found violetcottage. I just put in the number of comments, and clicked "pick a number" and it gave me #23!! I'm overwhelmed by the number of people who have entered the Quilting Gallery's Blog Hop & giveaway so far! I guess I hadn't really thought about how many entries I would end up with. And there are still a few days left to enter, so don't forget to enter! Click here to go to Quilting Gallery's list of participating blogs. I started to reply to everyone individually, but I didn't get very far. If you don't receive a personal reply right away, PLEASE don't take it personally! I'll be replying to a few each day. I think I actually replied twice to 2 or 3 of you. Whoops! I have read every single one of them, and I'm amazed at the number of cancer survivors, or those that have been touched by cancer in some way. When I'm not reading your comments, I'm either working, sleeping, eating, or quilting. There's a special quilt I'm working on. One of our friends (one of my husband's best friends since high school--30+ years) has been diagnosed with Stage IV head and neck cancer (the same type of cancer that I had), and his friends in California are putting on a benefit at the end of September to include quite a line-up of bands as he's a local producer/director. I decided to sew a music-themed quilt to be raffled off at the benefit, so I need to spend as much time as I can sewing every single day....which I don't mind a bit! Here's a sneak peek at the fabrics I'll be using. I'll be sure to post a pic of the quilt as soon as it's finished - I'm so excited about seeing this one complete! Yep, I know it's a "Back to School" Blog Hop, but I prefer to call it a "Celebration Blog Hop" since I don't have any kids heading back to school. Quilting Gallery is hosting a Back to School Blog Hop Party with Give-Aways, and I thought it would be a perfect time to do my very first give-away since it's my birthday month AND I just celebrated five years of being cancer-free! Woot!! My giveaway will include FIVE items to celebrate my five years, NOT 48 items to celebrate my 48 years! :D I've been celebrating all month long - stopping by Starbucks A LOT, buying fabric, going on a mini vacation with my hubby, buying fabric, falling off a bike, buying fabric, going shopping with friends, buying a Macbook Air. Oh wait.....I didn't get a Macbook Air....yet ;) It sure would make blogging a lot easier, though....don't you think? Oh.....I should get back on track with this whole give-away deal, huh? 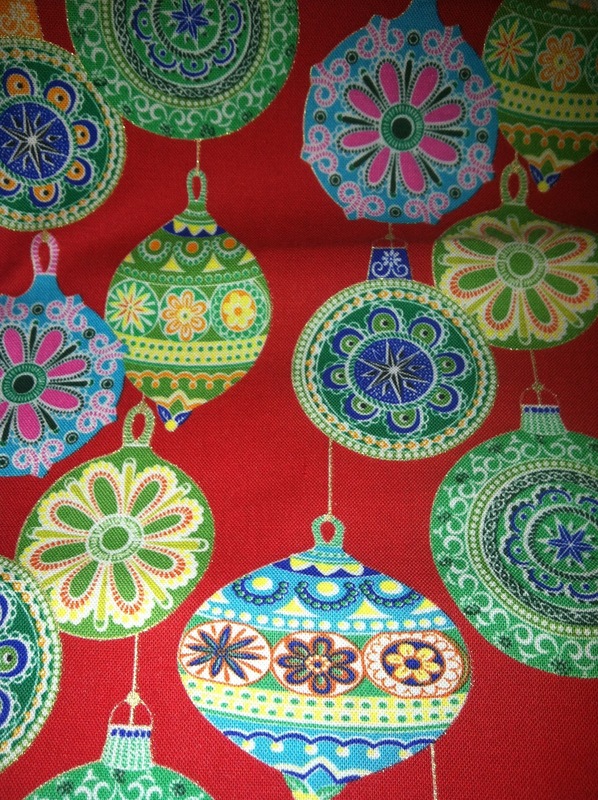 My list of goodies includes: Pellon Fusible Fleece, an Easy Dresden Ruler by Darlene Zimmerman, Fons & Porter Triangle Trimmers, a spool of White Gutermann Thread (100% polyester), and a Half Yard of Hallmark Damask Ornaments 100% cotton fabric. I absolutely LOVE this fabric! Hopefully, these items will get you started on a fun little project! All you need to do to be entered to win these lovely little gifts is to leave ONE comment letting me know that you're a follower of my blog.....that's it! It can't get much easier than that!! If you want, go ahead and let me know in that same comment how you like to celebrate special events or how you like to celebrate "back to school" time. The blog hop will start on Sunday (shortly after midnight Saturday) and will be open until September 3rd. My blog give-away is definitely open to all of my International Friends----sharing the love all over the world. Be sure to go to the Quilting Gallery or just click on the cute little button in my sidebar to check out all the other participating blogs. Good luck!! 1) It's my birthday month!! 2) I just celebrated my 5-year cancer-free anniversary!! Woo hoo! So......I'll be participating in the Quilter's Blog Hop Party with Give-Aways that the Quilting Gallery is hosting from August 25th through September 3rd. Each of the participating bloggers will be having a give-away! Plenty of chances to win very cool prizes! 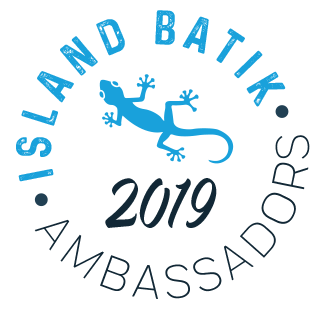 Be sure to stay tuned for more details coming up this week! My, how time flies! I'm playing catch-up with my Beginner's Quilt Along blocks. I finally finished blocks 5-8, and I just love the way it's coming together! Check out the link if you're interested in learning all these techniques. It really isn't very difficult. I've made a few mistakes, and there's one in particular (in one of my earlier blocks) that I'll definitely go back and fix before I put the quilt together because it'll drive me nuts if I don't! And here's how they look all put together on my closet doors! Kinda crazy/funky, I know, but that's okay with me :) Can't wait to see it all put together! Relay For Life has come and gone again. This year marks a major milestone - On August 14th, I will celebrate 5 years of being cancer-free! Woot! Last year, I made a quilt for the silent auction, and this year I made one to raffle. The raffle is definitely the way to go to bring in the $$$! I made a Jelly Roll Race Quilt with a Spin Jelly Roll by Whistler Studios for Windham Fabrics. This jelly roll is absolutely beautiful!! I even have an extra one to make something for myself :) I used Daisy Sprinkles by Michael Miller for the back, and Tree Huggers Tonal Dotty Yellow by Studio e for the binding. I struggled with which color thread to use, and finally decided to use a rainbow colored thread - PERFECT!! I absolutely LOVE how crinkly it turned out once I washed and dried it! When it was time to draw the name of the winner of the quilt on Saturday morning, we decided it would be best if someone outside of our group picked the winning raffle ticket. It just so happened that the social worker that counseled me and Eric after my cancer diagnosis was set up in the tent next to us (she's now the director of the local cancer resource center), so we had her pick the winning ticket. And guess what!!! The winner was one of my friends in my "Girls Night Out" group! I was so excited that someone I knew was going to receive this quilt. So happy for her! An interesting "fabric" thing happened on my way home from work today. I stopped to pick up my glasses at the optometrist's office downtown, and it just happens to be a few doors down from the quilt shop, and there just happened to be a parking spot right in front of the quilt shop!!! Oh no!! I thought, "You can do this, Lisa!" I got out of my car and kept right on walking. I picked up my glasses then headed back to the car and, just as I got to my car, I couldn't help but look at the quilts and fabric hanging in the window. I seriously had to tell myself "You don't need any fabric, just get in the car!" And I did it! So proud of myself! I knew that I wouldn't be able to go in there without buying something! And then.....I pulled into the neighborhood, stopped at the mailbox, and there was a key in my box to open up the "big package" box! It was my package from The Quilted B. I knew that I was meant to get fabric somehow today ;) I think I mentioned in a previous post that Barb at The Quilted B is closing down her shop. So sad :( So, I made yet another purchase. 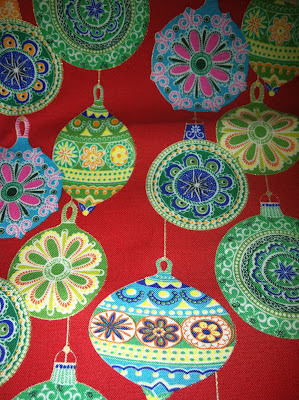 I just had to buy more of the Hideaway fabric by Lauren & Jessi Jung for Moda. Those fabrics are going to make one gorgeous quilt one of these days!!! And...there were several other fabrics that I just had to have----who could pass up such savings??? OK, I think I'm done buying fabric for awhile. I just need to start using what I have in my stash. I can do this. I was so tired after work yesterday, but I came home, made myself a cup of coffee, and sat down with my Fons & Porter Love of Quilting magazine that had just arrived in the mail. 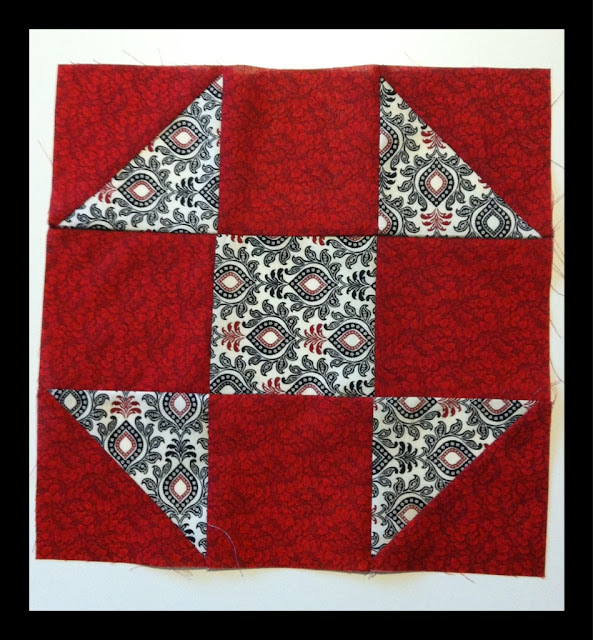 That motivated me enough to at least make the first Beginner's Quilt Along block. Woo hoo! I did it! And I love how it turned out. 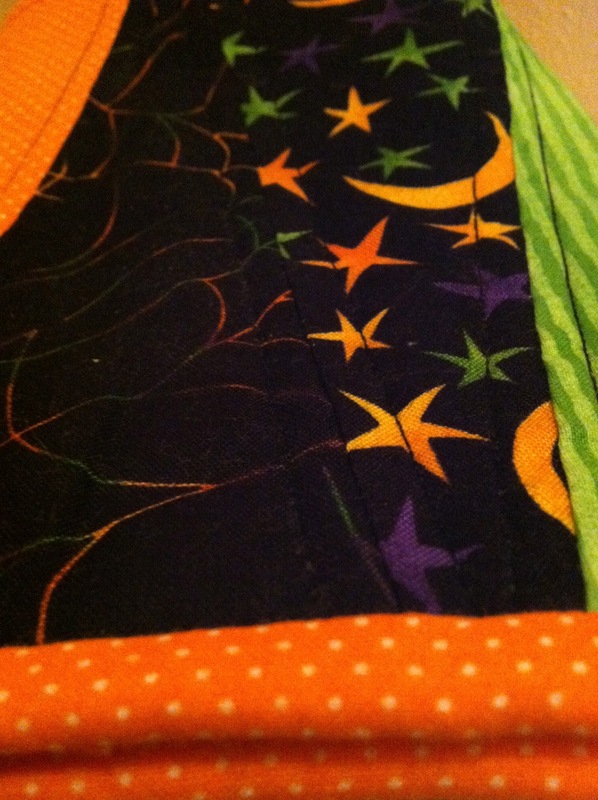 Here are the fat quarters that I chose. I just picked some random ones in my stash. 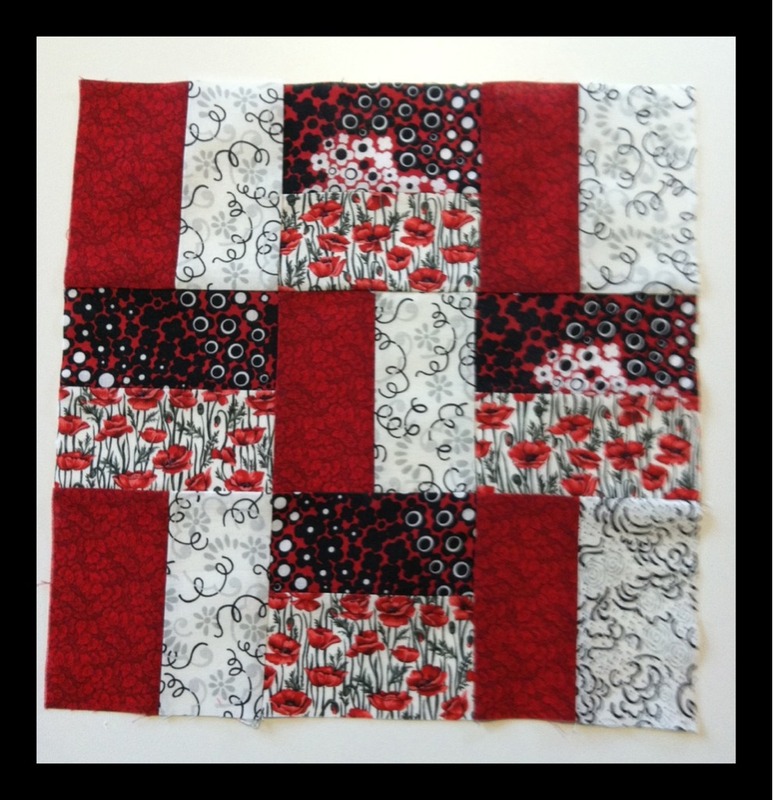 And here's the first finished block! I'll be using that lovely red in all of my blocks. It's not too late to hook up with the Quilting Gallery for this quilt along - Check it out!